This time of year we can’t seem to resist anything with a fall seasonal flavor, which means we have tried many random cupcakes from several locations that we want to share with you. What better way to do that then one big post?! The cupcakes below are from: AngelCakes in Frederick, MD; Sweet Sin Bakery and Cafe in Baltimore, MD; Caffe Latte’da in Baltimore, MD; Crumbs Bake Shop in Clarendon, VA; Georgetown Cupcake in Bethesda, MD; Starry Night Bakery and Coffeehouse in Westminster, MD; and Snickerdoodles Bakery in Coffee House in Hampstead, MD. Last time I reviewed AngelCakes it was a bit of a mixed review. I tried two cupakes, but only really enjoyed one. 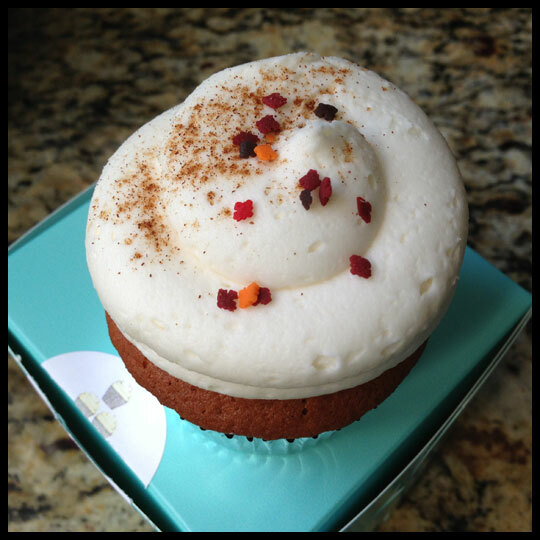 Well, this Pumpkin Spice cupcake work out in my favor with its super moist cake and great pumpkin spice flavor. The frosting was sweet, but not overly so. This cupcake actually reminded me a lot of a Dunkin Donut’s pumpkin doughnut, which isn’t a bad thing (I could eat those doughnuts all day, every day if my waistline would let me). Sweet Sin can often be a hit or miss, but their Chocolate Raspberry cupcake is completely decadent and just that alone has me thinking about their cupcakes often—its close proximity to my day job doesn’t hurt either. Plus, they are gluten free, so kind of healthy too, right? (Don’t burst my bubble on this…) Recently, I found myself with a fierce cupcake craving, so decided to stop in and see what fall cupcakes were on the menu. They actually had about four seasonal flavors that day, so I selected Pumpkin Spice and Pumpkin Apple Caramel. Unfortunately only one really worked for me. The Pumpkin Apple Caramel had large chunks of baked apples, but also contained a weird spice flavor that just didn’t win me over. 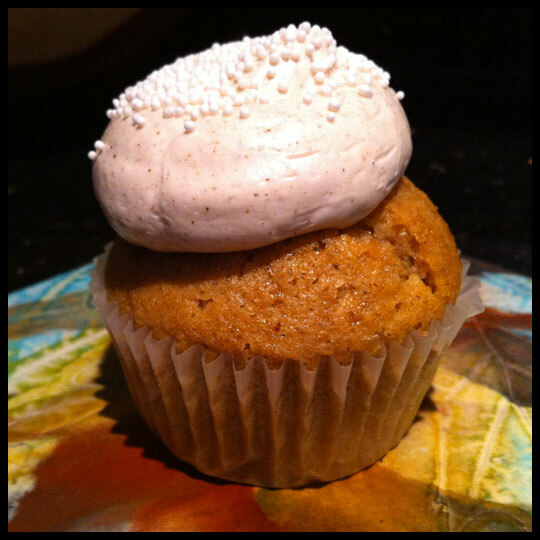 Luckily the Pumpkin Spice saved the day and ended up having a great flavor and smooth frosting. The cake on both was a bit dense and the texture wasn’t totally like “normal” cake, but since I convince myself that I was eating a healthy cupcake I decided to overlook that. This cupcake is a bit like a muffin pretending to be a cupcake. The cake’s texture screams, “I’m a muffin!” but, the flavor of the “cake” is really nice and the cream cheese frosting on top is smooth with just the right amount of sweetness. This cupcake is also HUGE which means you can share it or eat half immediately and save the rest for later (or just eat the whole thing in one sitting, we won’t judge). Pumpkin… sadly this cupcake did not live up to its namesake. The cake was moist and delicious, but didn’t taste like pumpkin at all, the icing was the same…both had a lovely vanilla flavor—which after a bit of searching on their website I discovered that Crumbs has two cupcakes that reference pumpkin: one that is just vanilla and one that is actually pumpkin flavored. As a Vanilla cupcake, this cupcake did NOT disappoint. Simple in flavor, but decorated for the season! Streusel Crumbs = Heaven. 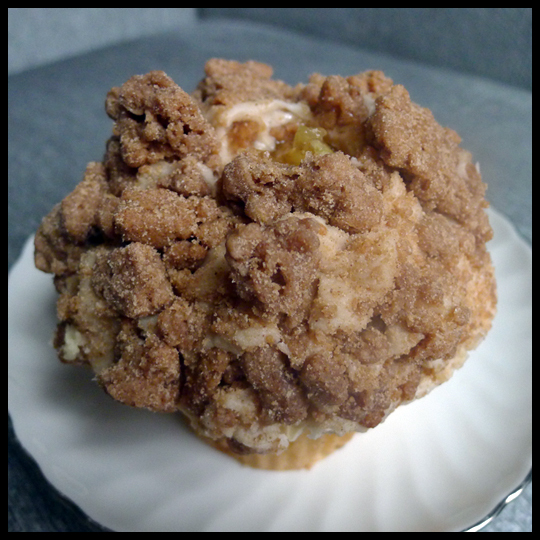 Filled with apple pie preserves, covered in delicious vanilla buttercream and topped with streusel crumbs, this cupcake flavor is amazing and complex. It didn’t just taste like apple cobbler, it embodied and elevated the flavors of its namesake dessert. 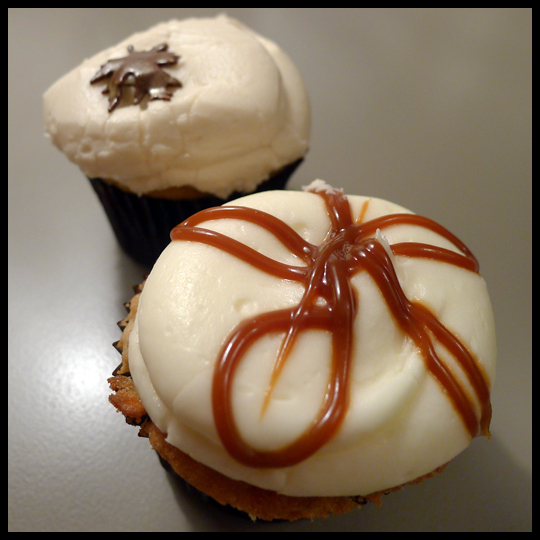 For November Georgetown Cupcake has some fantastic fall flavor offerings; including the two pictured above: Pumpkin Spice and Caramel Apple. The Pumpkin Spice cupcake was just as I remembered it from our 2011 Cupcake Tour—a little dense, but the flavors were amazing. The cake was full of spices while the cream cheese icing had a subtle maple flavor. Caramel Apple, whoa! 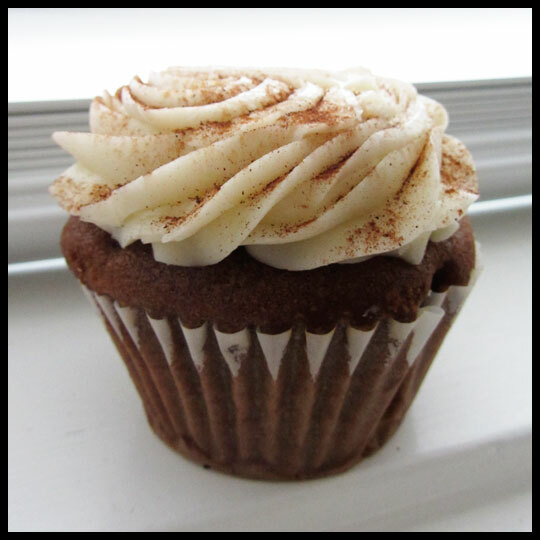 The apple cake was moist and the dolce de leche filling adds a whole new level of flavor to this cupcake. 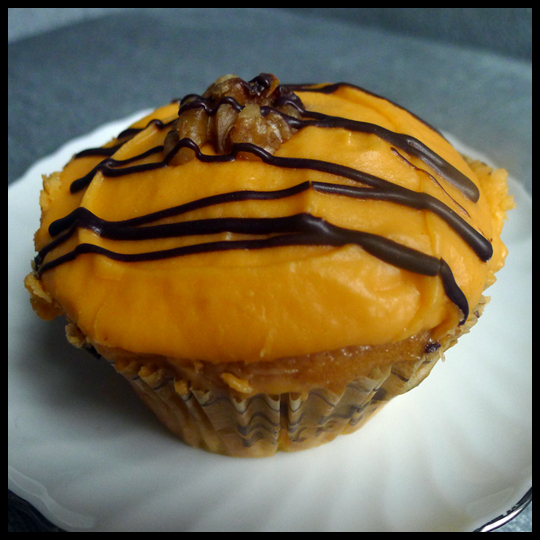 Both cupcakes are fall-tastic! Starry Night released this new flavor after I went in this year to pick their other 2012 Fall Seasonal cupcakes. Luckily they had them on my most recent visit! This cupcake was moist and light, full of flavor. It seemed more like a spice cake to me, but I’m not a big chai tea drinker (unlike Crusader Elisa). The chai buttercream was smooth and I think I picked up notes of cinnamon. Another winning cupcake from Starry Night! 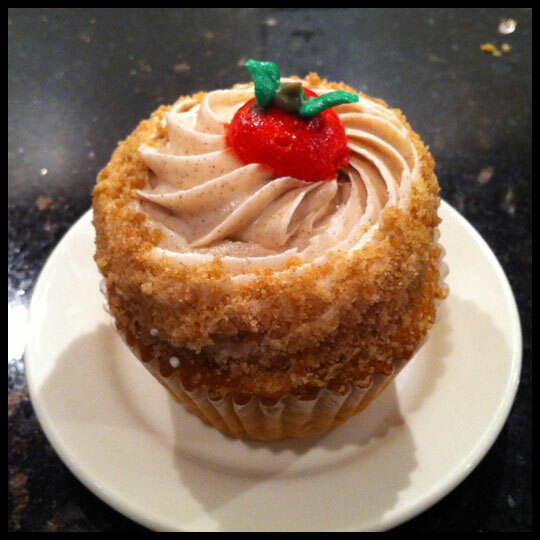 This Apple Cinnamon cupcake was amazing, to say the least. Snickerdoodles tends to always fill their large gourmet cupcakes, even if just with a whipped frosting, but this cupcake was filled with an apple cinnamon compote and topped with cinnamon buttercream. The crumb around the edge added a nice texture and gave it the feeling of an apple crisp. 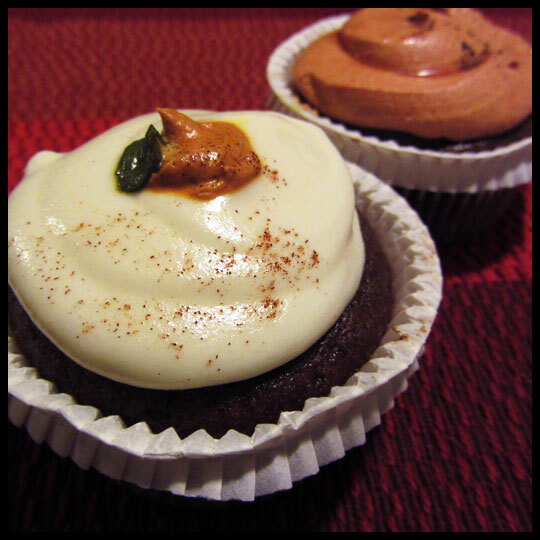 We hope that you were able to get out this fall and taste some seasonal cupcakes. Fall flavors are some of our favorites, but now with Thanksgiving bringing the season to a close, we are ready for the cupcakes that winter has to offer!